The Kingdom of Eternal Cold is a cultish destination not far from the center of Yakutsk, 4,885 kilometers from Moscow (yes, Russia is definitely a big country). Yakutsk is located in an area surrounded by round-topped hills called “sopki.” One of them, located a few kilometers from the center, is called Chochur-Muran, which means “pointed hill” in the Yakutian language. It is considered sacred by Yakuts, who believe it is the place of origin of their people. In Soviet times there used to be an underground shaft here, while the cave was used as a refrigerator to store food. In 2008 the cave became a tourist attraction and ever since visitors have had the chance to immerse themselves in a winter fairytale at any time of the year. 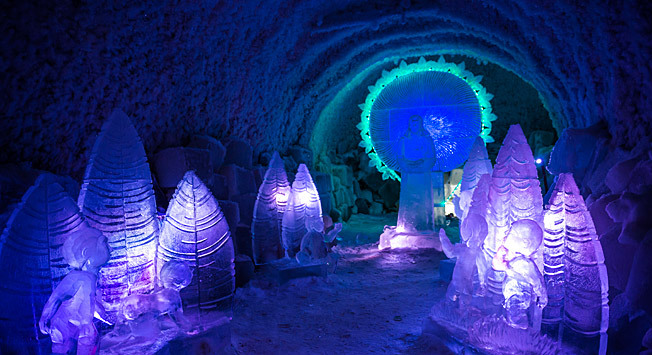 During the summer when the heat is stifling, inside the cave walls are covered with snow and ice sculptures abound. Eternal cold guarantees temperatures below zero throughout the year, with temperatures of about -10°C in the winter and -4°C in the summer. This is a matter of playful pride for Yakuts: in the winter, when it’s -50°C outside, you can come to the cave to heat yourself up in its comparatively stuffy -10°C temperatures. Permafrost is a part of the Earth’s crust that is permanently frozen. For a long period of time (ranging from 2-3 years to millennia) its temperature never rises above 0°C and ice never melts. Even underground waters here can only be found in the form of ice and its width can be more than a kilometer thick. Today permafrost can be found only in Siberia and Canada. However, 1-1.5 million years ago the southern limit of the gigantic belt of permafrost that covered the whole planet ran through the territory of present-day Colorado (U.S.). The only continent that has never been touched by permafrost is Australia. Between 60-65 percent of the territory of Russia is made up of permafrost, but the record belongs to Yakutia, where the depth of permafrost reaches 1.4 meters. Yakutsk, the capital of the Republic of Sakha (Yakutia), is the biggest city in the permafrost zone. The Kingdom of Eternal Cold museum complex is made up of a huge glacier split into several halls with exhibitions and attractions. Here you can get to know Yakutia’s national customs, musical instruments, kitchenware and food presented in the form of ice sculptures. The sculptural compositions here tell the story of the hunting, fishing, reindeer and dog sledding traditions of Yakutia. In the first hall visitors are welcomed by Chyskhaan, the Lord of Cold, whose throne covered by a bearskin. Yakuts believe that it is from here that the Russian Santa Claus “Ded Moroz,” sets off on his annual journey: first he meets Chyskhaan to get the special symbol of winter and then embarks on his tour throughout the country. The next hall is the domain of the Lord of the North. According to legend it is he who creates living beings out of ice and gives them life. Ice crystals (frozen groundwater) penetrate the walls and glitter, illuminated by lamps of different colors. Every year the sculptures are different with some being rotated and others unable to survive the conditions intact. The sculptures are an almost jarring mix of variety: Egyptian sphinxes made of ice stare at a frozen Venus de Milo, with a frosty Buddha sitting beside them. Visitors often glue coins to the Buddha, as some believe that in doing so your wishes will come true . The ceremonial hall, which has been specially designed for the rituals of blessing and purification, is embellished with ice swans symbolizing purity in Yakutian mythology and marital fidelity in European culture. Visitors can lie down on an ice nuptial bed covered with bearskins. Yakutian’s famed gems, shackled in heavy ice weights with diameters of about 20 centimeters, are also on display. A separate grotto hosts a paleontological museum, where the remnants of a life-sized mammoth stuffed with straw and even fangs is on display. Due to its permanent state of ice, permafrost preserves enormous amounts of ancient genetic material. In Yakutia scientists have found not only the most ancient ice on the planet, but also 80 percent of the world’s mammoth remains. The Shadrin, Yukagir and Berezovka mammoths, unearthed in the 19th-20th-centuries, stunned the science community upon discovery. Scientists often christen the little mammoths found in the permafrost with pet names such as Yuka or Dima. Upon an excursion’s conclusion, an archivist sitting in a special ice office will give guests a certificate with their name, attesting that they have visited the Kingdom of Eternal Cold. Before leaving the museum, don’t forget to stop by the ice bar: there you can try stroganina, a traditional dish of frozen meat or fish typical of Siberians and Northern peoples, and wash it down with vodka or champagne served in ice glasses. The Kingdom of Eternal Cold is located at kilometer 7 on the road to Vilyuisk from Yakutsk. You can reach the ice cave by taxi or private transport. There are no buses or “marshrutki” (mini-buses) that go there.